Before Steve crunched his truck yesterday morning… I’m such a tease! You’re going to have to wait until I get pics of the truck for me to tell you about that. Before Steve crunched his truck yesterday morning, he went back to the yard waste dump in town again. 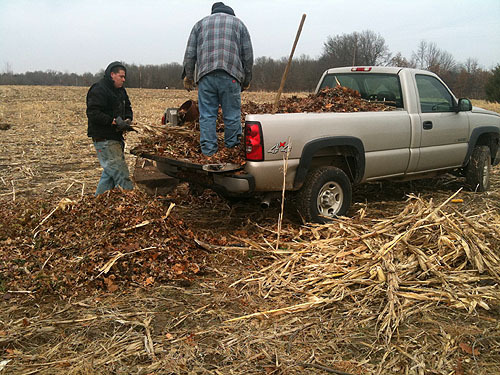 This time, he got the entire truck bed filled with cornstalks and leaves for mulch and compost. Woot! 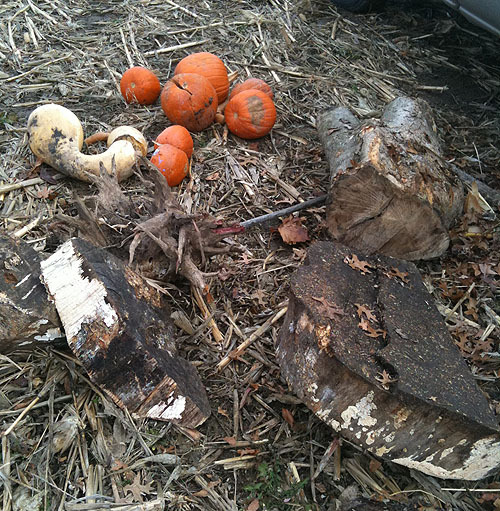 And more pumpkins (not all pictured here). The intact ones, I took inside and baked & pulped, getting another 15.5 quarts of pumpkin puree in the freezer, along with a bunch of seeds for roasting. 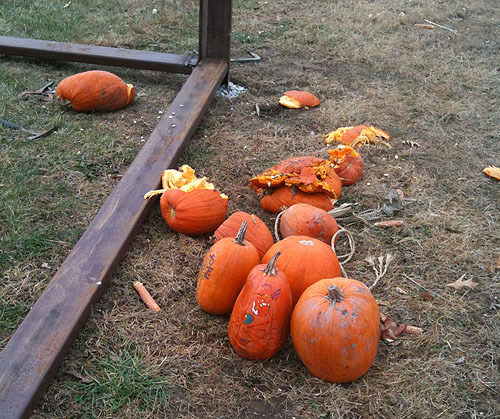 The pumpkins with freeze damage or that were not intact are being fed to the chickens. These two plants were also there for the taking. I have no idea what the one on the left is. Nor do I know what the one on the right is but I do know that it looks familiar. Anyone know what they are? I’m not sure if they can overwinter outdoors or need to be potted up (or if I even want to keep them). The one on the left looks like a dracena spike. The one on the right looks like an annual vine (if it were perennial I’d call it vinca). My guess is that they’re both annuals that would need to be brought in over the winter. The vine might make it (depending on exactly what it is) with some shelter or some cover (ie. straw). 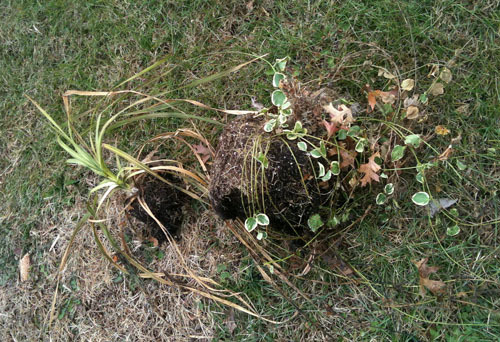 Every now and then we’ll find a piece of the vine from a pot that roots in the garden and winters over. We’ve never been able to make it winter over when we try though. Hope that the truck problems aren’t major. Anne, your calls on both seem to be in agreement with other folks. Thanks!